Outdoor plant care and maintenance is one of the hardest parts of keeping your landscape beautiful. Here are some helpful tips from the Garden of Eder! Thanks a million to Casey Lynn Lawrence for creating this video. Read her outstanding blog here. Proper watering is the most important thing to do for your plants. When the plants are first put in, they should be watered heavily for the first two to three days. This helps the soil to settle around the roots and eliminates air pockets. It is important that they are watered deeply, so that the water gets down to the bottom of the root ball. Make sure that the water is sinking into the planting hole and not running off the top. After the first few days, there is no set formula for how often to water. Some soils are heavier than others, and retain water. Hot, dry, and windy days cause the plants to lose water more quickly. The best way to determine if a plant needs water is to pull back a little of the mulch around several different plants in different areas and stick your finger or a trowel into the soil a couple of inches. If the soil is dry the plant should be watered. If the soil is wet and sticky, let the watering go for a while. This should be done about once a week. If the plants look stressed or wilted the soil should be checked more often. It is important to understand that a tree can wilt from either too much water or too little water. The roots of the plants start to die if the plant is over watered for too long. When the roots are dying, the plant cannot take up the water, even if there is plenty of water there. Therefore, it is necessary to check the soil before watering. It is important to remember that the plants need to be watered deeply when they are watered. Some people try to water with a sprinkler. While this works for the lawn, which has shallow roots, the water does not penetrate deeply enough for trees and shrubs. In addition, frequent, shallow watering encourages the roots to grow on the surface, and then they tend to dry out more quickly. On bigger trees, sometimes it is easier to let a hose trickle slowly onto the root zone for 30-45 minutes. For shrubs and perennials, it works best to water each one several times, each time until the water starts running off. The first few months are the most critical for new plantings, but supplemental water should be given for the first two years after the transplanting. It also helps to keep 2-3 inches of bark mulch in the planting bed. 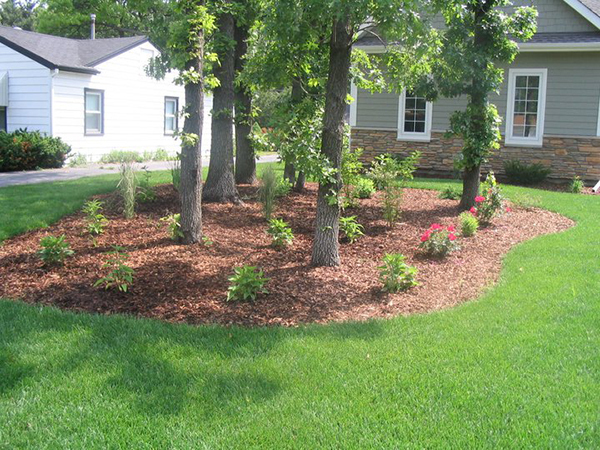 The mulch helps to keep the moisture in, as well as keeping the soil cool and inhibiting weeds. To reduce maintenance of your landscaping, add mulch above the ground level to every tree, shrub or evergreen in their yard. A tree is not really planted until its mulched. When a tree or shrub is planted, it should be covered with dirt to the original depth that it was in the nursery. Then, three to four inches of mulch should be added over this. Mulch will do many things. It will hold soil moisture so that watering can be reduced. The plants will establish and grow more rapidly because they will have a more constant supply of moisture available. Another purpose of mulch is to hold a steady soil temperature. Bark mulch does a better job of maintaining a cooler temperature than do the stone mulches. Most plants do better with the cooler temperatures and some, such as white birch require cool soil to stay healthy. 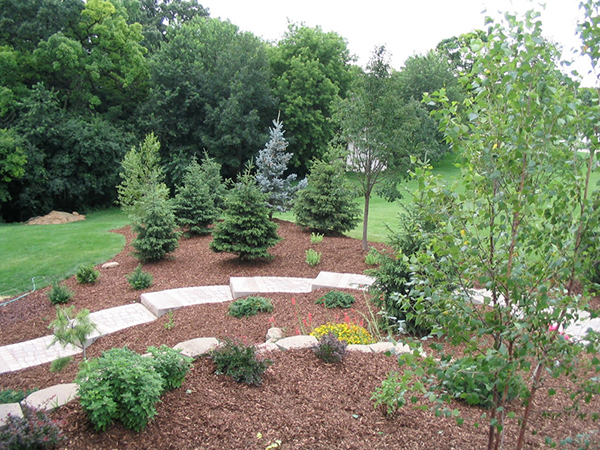 Adding mulch around your trees will also help to prevent lawn mower injuries ( a very common problem). The goal is not to eliminate weeds, but to reduce them to a low-maintenance level. In order to keep the weeds from getting established, take a heavy rake and rake back and forth to keep the top three inches of mulch loose. This takes no more than 10 minutes every two weeks for the average yard. After hand-watering or a good rain, you’ll find that the few weeds that have poked through will be easy to pull. Pulling weeds can be fun when they come out roots and all. After your mulch has been on top of the soil for awhile, you’ll find that fewer weeds will even germinate. If you find pulling weeds to be too much trouble, you could try using a pre-emergent weed killer or spray Round-Up every two weeks. Stone often contrasts with the natural colors of plants. The stones then become an eye catcher and detract from the natural beauty of the plants. 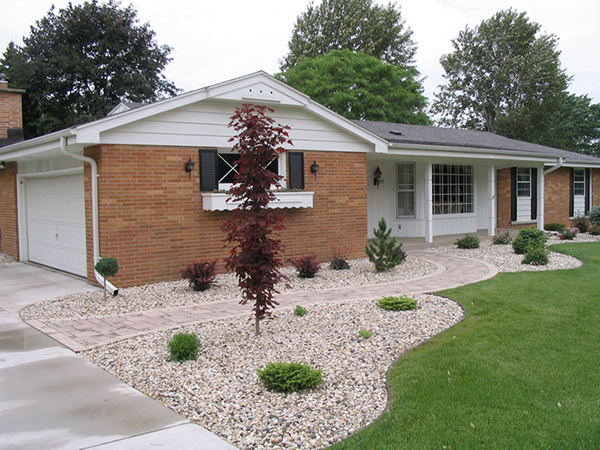 Stones also don’t hold moisture as well as bark mulch, requiring more watering. Plants will excrete leaves, small twigs, or grass clippings that fall into the stones and it looks messy. This adds more maintenance by having to pick up these objects out of the stones. Another benefit of bark mulch is that it decomposes slowly and adds organic matter to your soil. This can make heavier clay soil easier to work and more fertile. You will occasionally have to add a little bark to the top. Stones or chips are certainly better than no mulch at all but we highly recommend bark. Learn more about how to take care of your outdoors or see potential landscape designs by visiting us! 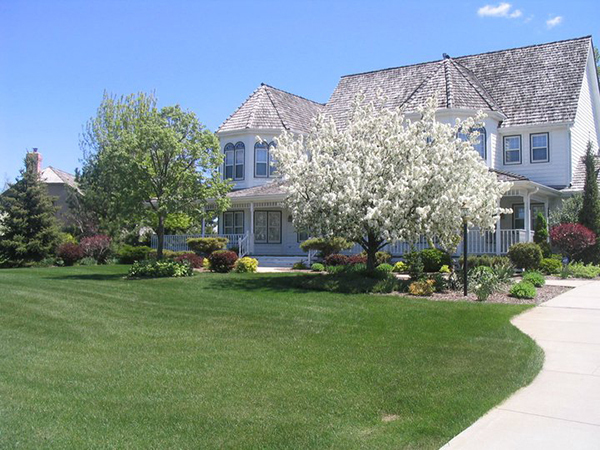 See why the Garden of Eder is your best choice for home and commercial landscaping, browse through our site or give us a call at (262)835-1000 or send an E-Mail message. If you want a few free tips, check out the Eder’s Tips page. Thank you for visiting the Garden of Eder…online.